Are you afraid of brettanomyces? 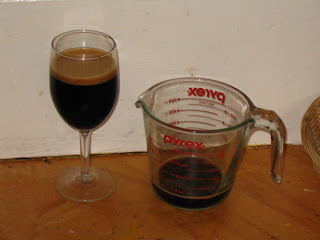 Inspired by a recent Basic Brewing Radio episode about the blending that went into producing Firestone Walker 10, I decided to try some blending of my own using my sweet Scandinavian Imperial Porter and dry Bourbon Brett Cherry Dark Belgian. Appearance –Medium-Light tan head on top of a deep brown beer which appears ruby red when held to the light. Nice and clear when it is thin enough to see through. Smell – Funky cherries right up front, with supporting aromas including caramel, and toasted chocolate. It is a powerful, complex aroma with hints of ethanol as the beer comes up to room temperature. Warmth also brings out occasional vanilla and oak notes as well. Taste – Smooth, with loads of complex brown and caramelized sugar character. There is also a bit of sourness in the back of the mouth, but it is not a sour beer. The fruit, malt, sugar, and yeast characters are all well integrated with no single part dominating the others. Mouthfeel – Medium-thin, with solid carbonation. The tannins from the wood also enhance the dryness of this beer. Drinkability/Notes – Surprisingly easy to drink for such a big complex beer. If I do this one again I will try to get a bit more bourbon into the flavor/aroma. This one is only about a year old now, so it has nothing but potential for improvement over the next few years. Appearance – Opens with a bare hiss after being stored at 50 degrees. Poured into my Stone RIS tulip it has a thin tan head which is only briefly supported by the thick dark-dark-dark brown body. You can just see though the edges when it is held at an angle. Smell – Toasted marshmallows, roasted malts, bread, hints of booze, and vanilla. A complex aroma to be sure, a bit muted though probably because of the low carbonation. Taste – Hints of vanilla bourbon, with a smooth chocolate roast. The roasted flavors are not as bitter, coffee, or charred as a classic Russian Imperial Stout, but probably more aggressive than a regular Baltic Porter. The supporting flavors range from toasted bread, to caramel, to hints of dried fruit (especially raisins). It is thick, and it isn't very bitter, but I think between the oak tannins and the alcohol it keeps from being too sweet. Mouthfeel – HUGE body with just a hint of carbonation. I primed this one for low carbonation, but I guess the yeast had already hit their limit. I guess it could use a little more carbonation, but it is actually fine as is. The alcohol is buried well, I can feel the warming in my stomach, but not the mouth or throat. Drinkability/Notes – Already tastes much older than its 6 months would imply. I can't pick up any contribution from the expensive heather honey, but maybe it is adding a depth of flavor that is hard to categorize. I also don't pick up any licorice flavors, but I have had a few people tell me they taste licorice without knowing its in there. I am so used to anise flavor being called licorice, that I may be tasting it and just not realizing what it is. Appearance – Pretty much black even when held up to the light. Nice creamy tan head with medium retention. Smell – Mostly cherry with just a hint of funk. Some toasty aromas and some alcohol. Very subdued. Taste – Light cherry and milk chocolate. Good restrained Brett funk that lends a nice complexity. It tastes more layered though, the cherry and the stout taste separate with the funk overpowering the stout. Oak is rather potent, but again tastes like it was dropped on top. Mouthfeel – Medium bodied with medium-low carbonation, best mouthfeel of the bunch. 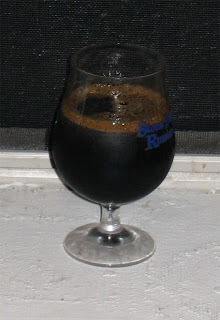 Drinkability/Notes – Not a great mixture, taste a bit rough with the funk and stout clashing a bit. Appearance – Creamy tan head with pretty good carbonation. The beer is opaque black with just a hint of red highlights around the edge. Smell – Big vanilla oak up front. Lots of middle of the road chocolate (not dark chocolate and not milk chocolate) along with a generic fruitiness. Taste – Roasted marshmallows and chocolate (s'mores without the graham crackers). A hint of fruitiness, but not as much as I expected. Very smooth flavor without any rough edges. As it warms a bare hint of funk comes out. Mouthfeel – Velvety, beautiful, some carbonation but not much. Drinkability/Notes – This mix really tames the funk of the Brett and cuts the thickness of the porter. However, the mixture is less complex than either one was by itself. This one matches the rule I have heard that 2/3 "fresh" beer with 1/3 "stale/aged" beer is good combination. I got linked to your site from the "Mold Infected Beer" thread on Beer Advocate. I just gotta say, wow. 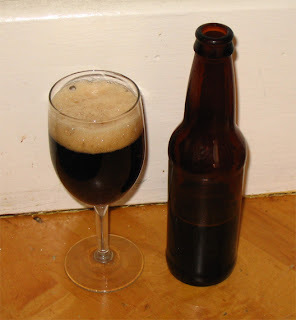 Some of your homebrew looks fantastic, especially this Scandinavian Imperial Porter. I started salivating just looking at it. Keep up the great work. You're an inspiration to all of us new homebrewers and beer drinkers. I really like that picture with a combination of white and black in the background, it makes the beer look almost evil. The SIP is very tasty, but the carbonation is a bit lacking which makes it seem a bit too sweet/thick. Hopefully the yeast is still slowly working and will eventually give this beer a bit more carbonation. I have started blending some of my sour beers with non-sour on a small(1 gallon batches)scale. Did the second ratio/blend not work well? In other words, in the future do you think a successful blend could be made from these two beers/styles. Also, are you a member of a homebrew club in D.C.? I live ~1hour a way and my club is good, but no one is really into sour beers. I'd like to try attending another club. The first and second blends were made from the same two beers, just in different ratios. I really liked the first blend where the wild beer was just accenting the stout, but in the second one the wild beer was too dominate for the smaller amount of stout. 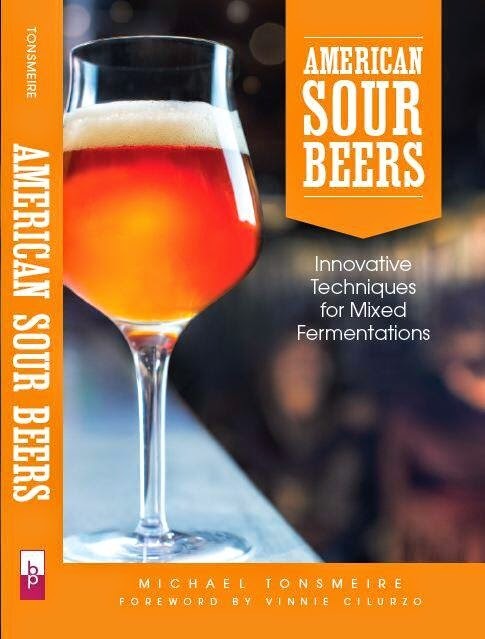 Have you stumbled upon any great sour/non-sour blends? I’m just in my infancy as far as blending goes. I have been a member of BURP ( www.burp.org ) since last winter. There are a couple guys in the club that do sour beers (but not enough that I haven’t been mocked for having Brett in half my beers). One of the guys was the AHA homebrewer of the year a few years back for a Geuze (really frickin’ delicious). If you want to come by a meeting let me know, the next one is on Saturday the 12th in Arlington. What volume did you carb the Bourbon Cherry Brett? I'm doing a beer similar and I was curious what you went with. Sorry, my notes eight years ago aren't as precise as they are now. According to the recipe post, I added .25 cups of table sugar. Batch was about 2.5 gallons in the bottling bucket, so likely around 2.3 volumes. 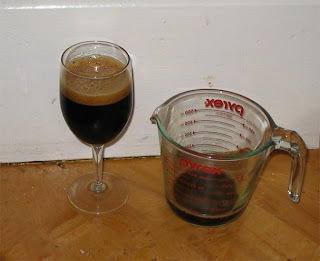 That is still about what I'd aim for; I like lower carbonation, especially in bigger/darker beers. Good luck!